UO Econ Seniors with Ben Hansen and Glen Waddell. Best Wishes to the Class of 2017! The Economics faculty and staff invite graduates and their guests to attend the department’s graduation ceremony and reception on Monday, June 19, 2017 at 12:30pm on the Knight Library South Lawn, which is located behind the Knight Library (close to Flower Booth #5 on the commencement map here). If graduates or guests need special accommodations, please notify the department at (541) 346-8845. Undergraduate students finishing all their Bachelor’s Degree requirements, including economics coursework, this academic year (Fall 2016, Winter 2017, Spring 2017, or Summer 2017) are welcome to participate in the ceremony. Be sure to complete the department’s undergraduate commencement registration form (here) if you plan to walk in the economics ceremony. Register for the ceremony by June 5th and only fill out this registration form once. If Spring 2017 is your last term as a student, make sure you apply for your degree on DuckWeb by the April 30th deadline. Please review your Graduation Checklist. All Doctoral and Masters graduates should contact the main office. This ceremony is for both economics undergraduate and graduate. Graduating students will be individually recognized. The ceremony will be approximately one and a half hours long, and a reception with refreshments will follow. Ceremony Location: Knight Library South Lawn. Our department event is an outdoor ceremony where shade or covering may not be readily available; please plan accordingly. The ceremony will be held rain or shine. The venue behind the Knight Library and is close to flower booth #5 listed on this map. Tickets are not required or available for our departmental ceremony. More information about our location can be found on the UO Commencement website. Graduates must arrive at least 30 minutes before the ceremony starts. Pick up your name card and then start forming two lines in the courtyard of PLC. To ensure you are sitting with your walking buddy, they must be in front of behind you in that line as our graduates make their entrance into the ceremony in two lines. Ushers will direct each row of graduates when to rise and proceed to the stage. When you get on to the stage, hand your name card to the faculty member at the podium to be read. Walk across the stage to the department head (Professor Kolpin) who will present your diploma cover to you. Take the cover with your left hand and shake hands with your right hand. A photographer will take your picture a few feet away from the base of the stairs once you get off the stage. Please proceed through this area in an orderly manner. There will be light refreshments provided after the ceremony. Be sure to get some photographs taken with your friends or with influential faculty members before you leave! We encourage graduates and their guests to also attend the University Graduation Celebration beginning with an academic parade to the Matthew Knight Arena at 9:00 a.m. Details regarding this celebration are available from the Office of Student Life. Regalia (cap, gown, and tassel) is required and can be ordered from the University of Oregon Duck Store beginning in early April. The Duck Store will be hosting a Grad Fair to assist students with regalia selection and graduation announcements. Grad Images will photograph all graduates at the ceremony and in various locations across campus. The Economics faculty and staff invite graduates and their guests to attend the department’s graduation ceremony and reception on Monday, June 13, 2016 at 3:00pm in the Memorial Quad. If graduates or guests need special accommodations, please notify the department at (541) 346-8845. Be sure to complete the department’s undergraduate commencement registration form if you plan to walk in the ceremony (register by May 25th), in addition to applying for your degree on DuckWeb. Please review your Graduation Checklist. All Doctoral and Masters graduates should contact the main office. Our department event is an outdoor ceremony where shade or covering may not be readily available; please plan accordingly. The ceremony will be held rain or shine. Tickets are not required or available. More information about our location can be found on the UO Commencement website. Regalia (cap, gown, and tassel) is required and can be ordered from the University of Oregon Duck Store beginning in early April. The Duck Store will be hosting a Grad Fair to assist students with regalia selection. Graduation announcements can be ordered from CB Graduation Announcements. Grad Images will photograph all graduates at the ceremony and in various locations across campus. The Careers in Finance, Wealth Management, Corporate Accounting, and Banking career fair first started nine years ago. This event introduces business and economics students to a range of options in professional finance, from banks to government agencies to corporations and financial services firms. The first half of the event features conference-style breakout sessions on different career paths, with the remaining half devoted to open networking in the Lillis atrium. Please mark your calendars for this year’s event: Wednesday, February 10th from 6-8:30pm. If you have any questions, please contact the department’s Director of Career & Academic Services, Bill Sherman. The Economics faculty and staff invite graduates and their guests to attend the department’s graduation ceremony and reception on Monday, June 15, 2015, 6PM in the Memorial Quad. 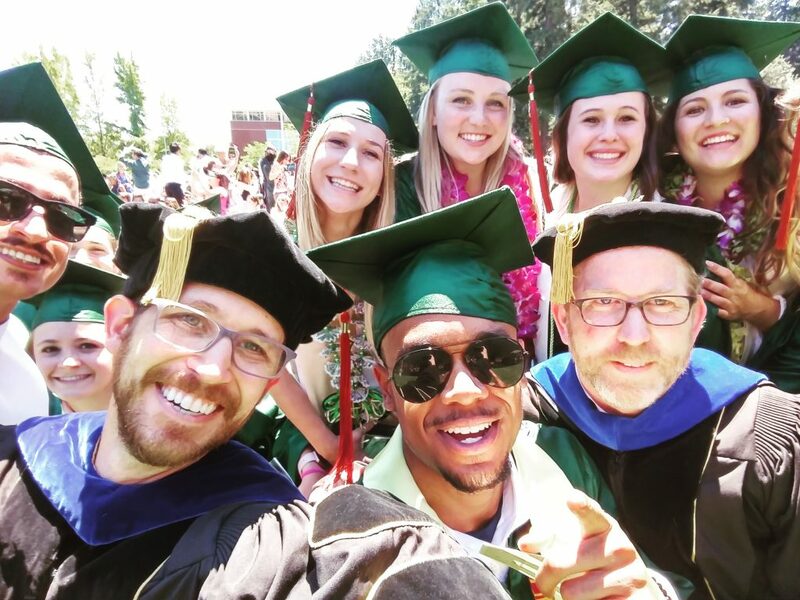 Please visit the main UO commencement website for main ceremony and general information. If you have any questions, please email economics@uoregon.edu or call the main office (541-346-8845).